Born in a Glasgow slum, Allan Pinkerton left Scotland as a wanted man (he'd joined a Chartist demonstration for political reform); was a fervent abolitionist, a friend Of John Brown's and a participant in the Underground Railway; yet he ended his innovative career supporting industrial bosses against labor (e.g., against the Irish coal-miners' terrorist organization, the Molly Maguires). Meanwhile, he had organized a detective agency still famous for its innovative sleuthing and crime-busting. Dozens of fascinating anecdotes, neatly demonstrating how criminals were brought to justice in 19th-century America when (especially in the West) the rule of law was not always firmly established, make this entertaining and informative. Pinkerton himself never quite comes into focus: Wormser refers to his "iron will" and calls him "abusive" toward his family, but offers few specifics. And, while it's dutifully noted that most of the b&w illustrations are "taken from the public domain," it would be interesting to know their sources. On the other hand, the generous-sized format is attractive. 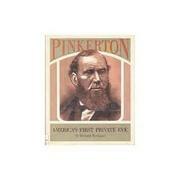 A lively introduction to Pinkerton's colorful exploits, well related to their historical setting. Bibliography; index.